Chris is a great example of a passionate young scientist who loves to research plant biology when he is not racing his dirt bikes in competitive motocross and cross country style events. While growing up on his parent’s crayfish farm (Boonjie Crayfish Park) in the town of Malanda in Far North Queensland, Chris was inspired by stories about a rapidly emerging field of science, called molecular biology and began to envision new wealth in understanding the molecular secrets of a plant cell and how these could be used to improve life. 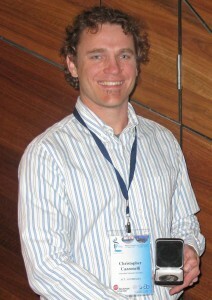 Chris Cazzonelli receiving the 2010 Goldacre Medal at ComBio. After completing his PhD in plant genetic engineering and molecular gene regulation at the University of Queensland, Chris won a highly competitive United States Department of Agriculture Postdoctoral Fellowship to work in the Agricultural Research Service in Texas, USA. There he investigated the molecular nature of gene activation, gene silencing and remote sensing of plant stress events. In 2006, he was recruited by PEB to work with Prof. Barry Pogson and determine what regulates the production of a group of important molecules called carotenoids. Carotenoids are colourful yellow, orange and red pigments synthesised by plants. Carotenoids form a valuable part of the human diet. A good example of this is the “β-carotene” humans get from vegetables like carrots, which is essential for vitamin A production. Lack of vitamin A can lead to blindness and other immune problems, which is a significant concern in developing countries. The Golden Rice Project, which increases the levels of β-carotene in rice, is a great example of a scientific program working to solve nutritional problems, a future possibility for this research. In plants, carotenoids are necessary for photosynthesis, photoprotection and the production of phytohormone “signalling” molecules. Signalling molecules form communication networks within the cell and allow the plant to respond to internal and external cues, such as changes required for development or adapting to environmental stress. One of Chris’s achievements was to identify a genetic regulator that interrupted the production of carotenoids in plants, particularly in the shoot meristem (growth tip) and flowering tissues, which are active sites of cell division, differentiation and memory forming processes. This provided strong implications for a novel epigenetic mechanism by which plants regulate carotenoid levels and epigenetics is one of the hottest research areas of human and plant genetics. Epigenetics is a “memory process” where changes in DNA binding proteins, called histones, facilitate the opening of chromatin and regulate the level of gene expression without altering the DNA sequence. Chris and colleagues characterised a chromatin-modifying gene (SDG8) that promotes permissive expression of the carotenoid isomerase gene (CRTISO) thereby reducing the accumulation of the carotenoid, lutein. Lutein is the most abundant carotenoid in nature and limits macular degeneration of the human eye. The team found that the correct carotenoid concentrations were required to control developmental processes, such as shoot branching and root development in the Arabidopsis plant. The publications that followed these discoveries, include a research paper in Plant Cell that, was highlighted as recommended reading by the Faculty of 1000 (www.f1000biology.com). In addition, several research papers were published in top shelf journals such as Molecular Plant, Functional and Integrated Genomics as well as Plant Signaling and behaviour. The impact of his work is credited as having started a new wave of research on carotenoid regulatory biology and opened an invitation to review the field of carotenoid regulation for Trend in Plant Science. Chris aims to ride this exciting wave and continue to investigate the role of carotenoids in controlling flowering processes, fruit development as well as root and shoot architecture in agronomic important crops such as tomato. Due to the significant roles that carotenoids have been discovered to play in coordinating cellular regulation as well as plant growth and their implications for human health, the future possibilities for this research are extremely exciting. Cazzonelli, CI. (2011) Carotenoids in Nature: insights from plants and beyond. Functional Plant Biology. 38: 833–847. Invited Goldacre Publication. Cazzonelli CI and Pogson, BJ. (2010) A balance between source and sink: regulation of carotenoid composition in plants. Trends in Plant Science. 15(5): 266-274. Pubmed. Cazzonelli CI, Cuttriss AJ, Cossetto SB, Pye W, Crisp P, Whelan J, Finnegan J, Turnbull C and Pogson BJ. (2009) Regulation of carotenoid composition and shoot branching in Arabidopsis by a chromatin modifying histone methyltransferase, SDG8. Plant Cell. 21(1):39-53. Pubmed. Cazzonelli CI, Roberts A, Carmody M and Pogson BJ. (2010) Transcriptional Control of SET DOMAIN GROUP8 and CAROTENOID ISOMERASE during Arabidopsis Development. Molecular Plant. 3(1): 174-191 Cazzonelli CI, Nisar N, Hussain D, Carmody M and Pogson BJ. (2010) Biosynthesis and Regulation of Carotenoids in Plants- micronutrients, vitamins and health benefits. In Plant Developmental Biology- Biotechnology Perspectives Vol 2. Ed. E.C. Pua and M.R. Davey Springer-Verlag Berlin Heidelberg, 117-137. Pubmed. Cazzonelli CI, Yin K and Pogson, BJ. (2009) Potential implications for epigenetic regulation of carotenoid biosynthesis during root and shoot development. Plant Signaling & Behavior. 4(4):339-341. Pubmed. Howitt CA, Cavanagh C, Bowerman AF, Cazzonelli CI, Rampling L, Mimica JL, and Pogson BJ. (2009) Alternative splicing, activation of cryptic exons and amino acid substitutions in carotenoid biosynthetic genes are associated with lutein accumulation in wheat endosperm. Functional and Integrative Genomics. 9: 363- 373. Pubmed.